Today marks the 10th anniversary of the first Apple Store, opened at 10am sharp in the dark ages of 2001 in a Tyson’s Corner Center in Virginia. Fast forward ten years and Apple Stores have mushroomed to a global phonemenon represented in 11 countries with 88 stores abroad and 236 stateside. The impact of this expansion? - Apple shares have skyrocketed nearly 34 times in value from $9.98 back in 2001. 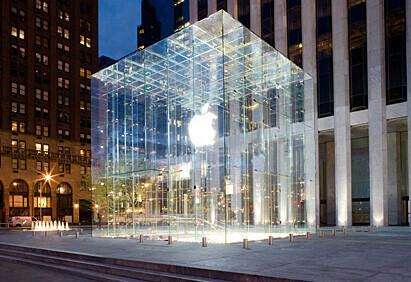 - Stores earned some $3.2 billion, or nearly 13% of Apple's sales last year. - In the first trimester of this year alone, sales at Apple Stores grew 90% y/o/y to $3.2 billion. - Visitors surged by a third in the first quarter. - Pass training sessions on photography, video and others, sometimes even at night. - Lodge for hours just to check their emails. - Write novels (model Isobella Jade has!). 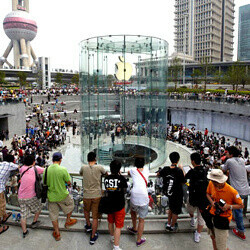 Even from the start it was huge as 500 of the notorious fanboys lined up in front of the first Apple Store in 2001, but it’s been a long road for the company to establish an even wider following with hundreds waiting in line for a new product or camping in front of the store the whole night. And it wasn’t all that evident when it started a decade ago. Quite the contrary, for this period Gateway Country stores have shut down operations, Circuit City has gone out of business, CompUSA has closed its stores and phone makers like Nokia for instance have opened and subsequently shut doors to flagship stores. 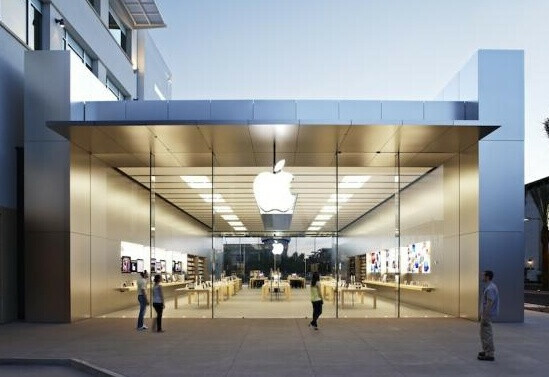 But even relatively successful stores have borrowed features from Apple Stores forcing Cupertino to try to trademark their unique design. Best Buy, for once, introduced its Geek Squad, a support team a-la the Genius team. Companies like Microsoft have tried to emulate the same service as it deployed Gurus at electronics retailers and also opened its own retail chain in 2009. The person who kick-started Apple’s retail chain shoulder-to-shoulder with Steve Jobs was Ron Johnson, the creative locomotive behind Target’s store redesign a decade ago. According to various sources, he was the one who pushed the idea of personal support with the Genius Bar despite the initially pessimistic reaction of CEO Steve Jobs. Now, years after the Genius Bar was launched to answer questions about personal computers, it supports the company’s complete lineup including iPods, iPhones and iPads. And it’s this personal flavor that many notice when they enter: “Employees are taught how to work together because customers notice when employees don't get along,” Apple employee Alex Frenkel, author of the book “Punching In: The Unauthorized Adventures of a Front-Line Employee,” writes. “Employees also hand out business cards as in high-end clothing stores, an act that calls them out as individuals in a way not typical of traditional retail,” he adds. Staff often includes qualified photography and video professionals known as Creatives, who take care of trainings and “One to One” sessions and workshops. Ron Johnson was also the man behind the stores design, which has evolved tremendously in the past decade, but the novelty stores bring remain rooted in Steve Jobs core understanding that innovation “comes from saying no to 1,000 things.” The industrial all glass design accents, wood tables and stone floors has been there almost from the beginning, but since then stores have opened in a mini and maxi variants with the biggest one in London’s Covent Garden, in malls and as standalone locations with 17 flagship stores, including desing award winning 32-foot glass cube store on 5th avenue in New York. The New York cube also takes pride as being open 24 hours a day, every day of the year. In 2006, stainless steel walls and backlit lighting started dominating the chain contributing to the simple futuristic approach of the company. In addition, every launch of a new Apple Store comes with a massive giveaway of T-shirts and other goodies. 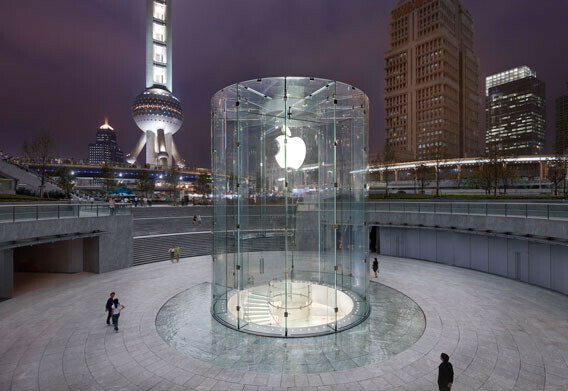 Previously limited only to the United States, retail locations with the bitten apple logo, have shown up in Europe and Asia with the stress on Chinese operations lately. But stores don’t stay the same as we’ve seen in the past that many have changed with new product launches and that’s what’s part of the unique Apple marketing approach. 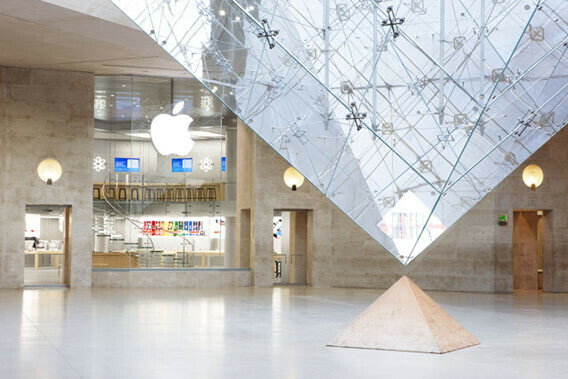 Apple Stores have been in the core of building the pedestal that the bitten apple logo has become. Apple doesn’t sell phones – it sells the iPhone. It doesn’t sell tablets or music players – it sells iPads and iPods. All of those brands are not fragmented and the Apple Store is the ultimate place where the different parts of this ecosystem meet to create this almost addictive following. The Apple Store is not a retail experience, but rather a social phenomenon appearing in the Simpsons and Southpark, getting its own version in building blocks. We could argue that even strong devices like the upcoming powerhouse that is the Samsung Galaxy S II can never reach the popularity of the iPhone and will never truly reach an iPhone killer status even if they outdo iPhones in every feature. And Samsung has taking the forefront of this wave of producers wanting to outdo Apple by more megahertz, bigger screens, inches of thickness, weight. Quite frankly, a true iKiller product might be already out there by many standards, but it’s the lack of brand recognition that puts it in relative oblivion months after its launch. In the interview below, Steve Jobs exclaims about the company’s retail stores: “they’ve succeeded beyond our wildest dreams.” But the continuation of this success will depend on a number of factors. The company plans to launch 40 new retail stores and three-fourths of them are to be outside the States this year. While Apple has long been an international company, it’s just beginning to tap into the Asian market and some analysts like Asymco’s Horace Dediu argue that China will become Apple's biggest market in less than seven years. We would hesitate to give an exact period, but the booming Chinese market, much larger in size than the one in the States, will most probably turn to be of huge importance for Cupertino. One thing however is for sure – Apple has managed to pull the strings of innovation in tech marketing in the last couple of years and is likely to continue doing so in the near future. Before I start...let me say that apple makes good products and I do own an ipod and will always use that as my mp3 player for the gym and what not (although i do have all my music on my phone too). 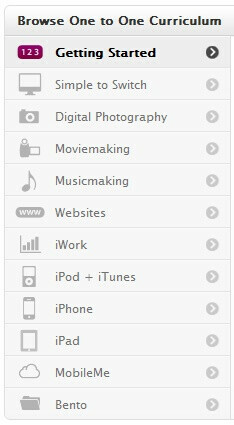 I use an ipod touch as my mp3 player not because its apple, but because no other mp3 player does what it does. Some of those comments of the end of this article explain perfectly why I dislike apple and the general public so much. It doesn't matter what any other device can do...people will always choose an apple product because of the apple on it. If they recycled a phone that was made in 2000 and put an apple symbol on it then everyone would want one. If you took an iPhone 4 and put "abc company" on the back instead of an apple with a bite out of it then no one would buy it. It doesn't matter what any other manufacturer does...if it doesn't have an apple then it isn't cool. It has become a matter of fashion over function. I worked at AT&T and whenever a customer wanted an iPhone I would ask them what the like about the phone and why they want one (so I could make sure they are getting the right phone for them). About one out of every 100 people could give me a legitimate reason. Think for yourselves people...don't follow the sheep. The reason people like Apple is because they make good products. As you said you prefer an iPod touch. Buying Apple products doesn't make you a sheep. It's popular because it's a great product. yea but its different. Ipod Touch is a sensible choice because for that class of products, there is nothign comparable. The only comparable product is Zune HD, which does have some advantages, but ultimate the Ipod trounces it. Ipod classic, again, nothing comparable in that class of products. As far as Ipads, Iphonse, Imacs, etc. its a different story, these products may have been ahead of the curve at one point into their prodcut lifespan, but is no longer the case, there are superior products that are of similar type out there, but Apple has secured such a brand following that it doesnt matter, the HTC Evo vs Iphone 4 video on Youtube sums it up. I own a nano 4th gen and love it in every way I"v tried a Zune but the simplicity of adding content onto the devise is kinda time consuming. I still own a Sony MP3 walk man and that's just as easy to load music onto like an ipod but personally I believe that there are many great product's out there that are just as simple to use & operate as an ipod but for some reason Apples more loved I guess marketing did the job. I my self keep asking the age old question PC or Mac I have a PC at the moment and everyones telling me to jump on board but as I see it I could just upgrade the parts on a PC to match a new Mac's specs and it would still be cheaper then a Mac. As for viruses and spyware tempting as it may Mac's do get viruses so they're not safe proof. I my self am not that lazy to run a good anti virus once a month to keep my PC running smooth.